Holiday: Sibu Island at Terengganu, Malaysia. Sibu Big Island (Pulau Sibu Besar), Johor, Malaysia (meaning Dead Chicken Big Island, it's next to Dead Chicken Small Island). Pulau Sibu forms part of the thousand chain of islands lying 12 kilometers off the east coast of the West Peninsular is good for Holiday Vacation. 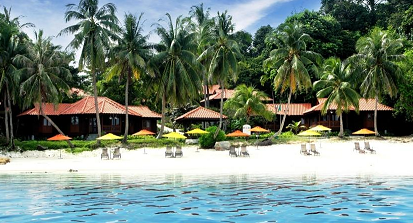 The name Pulau Sibu usually refers to the main island in this cluster, which is Pulau Sibu Besar (Sibu Big Island). Other islands in this cluster including Pulau Kukus, Pulau Sibu Tengah (Middle Sibu Island) and Pulau Sibu Hujung (End Sibu Island) and. The tuarist can pick up the boat to Sibu Island at Tanjung Leman jetty, it is about 120 km north of Johor Bahru on the Mersing road. The Awesome View from The Hill. 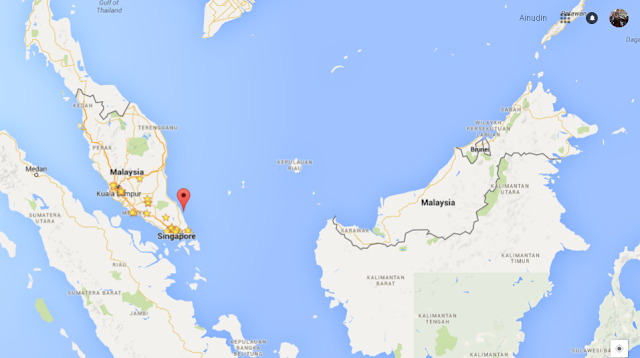 Pulau Sibu is shaped like a triangular hour glass, about 6 km long and never more than one km wide it's whole length. 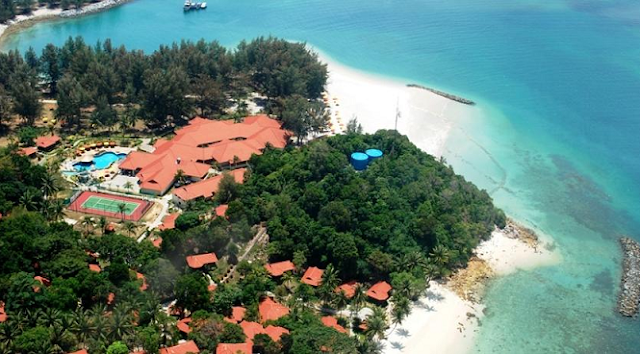 You can see a great views from these beaches including Pulau Tinggi that is a string of smaller islands to the south. The view even much more beautiful when you see it from the top of the hill. The north eastern location of the island is like a golden brown beaches that slope away gradually and offering great ideal swimming conditions. On a clear sunny day, Tioman Island can be seen to the north. It is awesome to watch the "moon-rise" at full moon period. The view is so spectacular and it is a sight not to be missed. The south western coastal is sheltered from almost all strong winds during raining season and the sea here is frequently as calm as resembles water of the lake. You can see plenty of mangrove trees to grow along the shore. The southern east coastal of Sibu line up as a series of steep, a lot of abrupt cliffs with a rocky shoreline at their base and provides shelter to the village behind. The rocks here, and where exposed at other points on the island, are colorful and contorted. This is due to their composition of layers of volcanic ash run through with later lava combining to produce lacework patterns. Low down on headlands near the sea, rock pools are frequent and contain miniature worlds populated by colorful fish, crabs and corals. At Tanjung Keramat the cliffs contain caves and arches. There is a village called Kampong Duku at the south. There you can find some basic facilities for about 150 villages towards the southern tip of Sibu such as a police post, mosque, school, clinic and drinks stall. The entire village got electrical supply from solar powered. Hence, it is a good place to escape from the hustle of your daily work at the office. The environment is so calm and suitable for getting a great holiday with your family and friends.